Madsen Wire Products has been in business since 1938 fabricating wire parts and shipping them throughout Indiana, the Midwest and across the entire United States. We have led the way as the Midwest wire manufacturing company that you can trust to deliver quality wire parts. We make wire shelves, wire baskets, racks, welded wire assemblies, wire guards, wire store fixtures and much more! We serve the commercial restaurant, grocery and bakery market along with retail point of purchase, automotive, industrial, lawn and garden and much more. We can finish your wire parts with powder coating or plating. Originally we were known as Jaxon Wire Products, Inc. producing wire products almost exclusively for the material handling industry. Located in Jackson, Michigan, many of our customers serviced the Midwest area automotive industry. 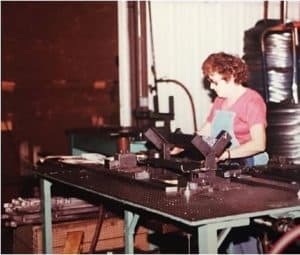 From our early beginnings in Michigan to our strength today in Indiana, Madsen Wire Products is the Midwest wire fabricator, growing in quality and technology based equipment to supply all your wire forming needs. You can look at other wire fabricators but you won’t find one as flexible to serve your needs and always looking to grow to meet the current marketplace. For a Midwest wire fabricator who understands and listens to your needs, contact us at 260-829-6561 or request a quote. The start of Madsen Wire Products dates back to 1938. We got our start as Jaxon Wire, a regional producer of fabricated wire products located in Jackson, Michigan. Jaxon Wire was an established leader in the development and manufacture of a wide range of wire, wire mesh and expanded metal baskets and containers. Jaxon Wire cornered the market on material handling products including “Jaxon Rugged Jax” baskets and containers. In 1981 the company changed ownership and became known as Madsen Wire Products, Inc. In 1982, the company moved a few miles down the road to Orland, Indiana just over the Michigan state line. The company was acquired in 1988 by Wall Industries. At that time Madsen Wire was the major supplier of wire parts to K-Mart stores. Over time and as the retail market changed we began to focus our custom wire forming on store fixtures and the retail point of purchase displays for many new customers. We also got into the bakery and food service industries. In 2005 Madsen Wire was then acquired by General Cage who was a major provider of dog cages and other wire products to the pet industry. 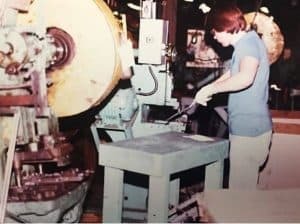 As many wire cages started going oversees for manufacturing, General Cage decided to sell the assets of Madsen Wire to family members who were involved in the growth of the metal fabrication company, Noble Industries, located in Noblesville, IN. This sale was a great complement to the sheet metal products sold at Noble Industries. The future is bright for Madsen Wire as the wire forming industry is rebounding in the United States. We look forward to adding much to the already great history of Madsen Wire Products. Madsen Wire plans to continue our steady growth through investment in the latest wire forming and fabricating technology, diligently working to have an educated and talented workforce, and preserving our focus on the needs of our customers. The owners of Madsen Wire Products have “forward thinking” in their DNA. Come back regularly to see the growth of Madsen Wire as we have great plans for this wire forming company.